In another bit of good economic news for the White House, a pair of private sector groups that track consumer confidence reported significant positive movement this past week. The Conference Board and Gallup both reported the highest levels of confidence among consumers since the financial crisis ushered in the Great Recession. 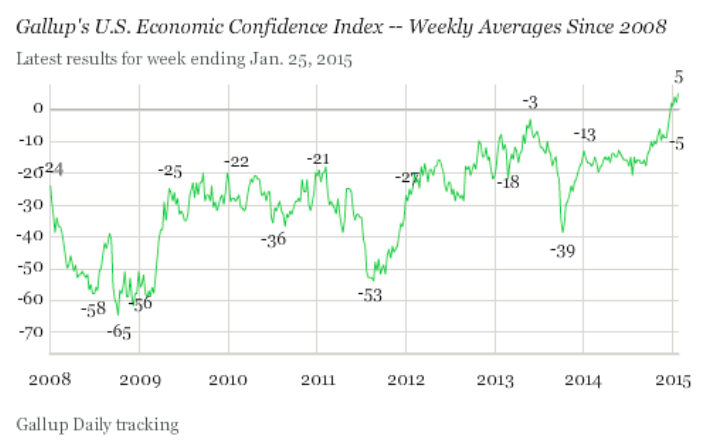 Gallup’s Economic Confidence Index spiked to its highest level ever last week, for five weeks in a row in positive territory. Gallup began tracking the economic confidence of Americans on a daily basis in 2008, and until recently, the poll had never been in positive territory. During the financial crisis and the beginning of the recession, the index plumbed lows of negative 65. Tuesday’s release highlights a sharp upward trend in attitudes toward the economy. In the third quarter of 2014, for example, the index was near negative 20. She added, “The president's positive spin on the economy is certainly defensible as most economic measures have been trending in a positive direction over the past year, including official government reports of economic growth and unemployment, but also measures that Gallup tracks, including on employment, company hiring and consumer spending. Facing economic growth and a president whose popularity is rebounding, GOP lawmakers who had hoped momentum from the November midterms would drive major conservative changes in Washington may now find they need to trim their sails – or be seen as interfering with the recovery. The Conference Board on Tuesday said its Confidence Index had jumped from 93.1 in December 2014 to 102.9 this month. Consumers’ judgment of the economic climate and expectations for the future also improved. The dual announcements came just a day after another Gallup poll showed that President Obama’s approval rating had again risen to the 50 percent level, the highest since 2013, after bottoming out at 38 percent in September.